Good laws derive from evil habits. Two characteristics of government are that it cannot do anything quickly, and that it never knows when to quit. A government founded on theory or abstract ideas. A system of government in which the least capable to lead are elected by the least capable of producing, and where the members of society least likely to take care of themselves or to succeed, are rewarded with goods and services paid for by the confiscated wealth of a diminishing number of producers: "There are those who say that examples of ineptocracies are the occupy protesters movement and the economic crisis in Greece." Equality of power or rule; a system of government in which all the people possess equal political power. 1. A state, country, or place that is governed by the worst, unqualified, or least competent people: It is obvious that there are kakistocracies existing in several parts of the world or so many of their citizens would not be so desperate to immigrate to other countries in hopes of finding better living conditions. 2. Etymology: from Greek kakistos, "worst", a superlative of kakos, "bad". If men and women of capacity refuse to take part in politics and government, they condemn themselves, as well as the people, to the punishment of living under a bad government. An unprincipled person in a government position or an incompetent leader of a corrupt governing system: After he was elected, the governor proved to be another kakistocrat who was enriching his supporter and letting the state fall into economic ruin. A reference to a bad administration or management of a political system that is in charge of governing people: When the people voted to have a new leader of the country, they didn't expect to have a kakistocratic regime making their lives miserable. Relating to a form of government that is controlled by its corrupt or morally bad political leaders. A reference to an election of a leader of people who is inexperienced, incompetent, or too corrupt to be the head of a government: There are some voters of places in the world who discover that a person is kakistocratically dishonest, unscrupulous, untrustworthy, and nefarious to be governing their country, cities, etc. 1. 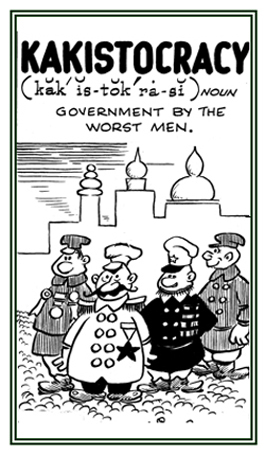 A government characterized by rampant greed and corruption. 2. A ruling body or order of criminals; a government run by thieves; a nation ruled by this kind of government. Political leaders who are a ruling body or order of thieves stealing from the people: "There are nations that are being ruled by governmental kleptocrats who live in luxury while the people are living in poverty." A government ruled by judges. Judgments in a kritocracy are arrived at by the personal opinions of the judges. A government by judges; the governmental rule of judges in which they reach desirable results that fit some particular social philosophy. Rocks which are composed mainly of light-colored minerals. Cross references of word families related directly, or indirectly, to: "master, lead, leading, ruler, ruling, govern": -agogic; agon-; arch-; dom-; gov-; magist-; poten-; regi-; tyran-. Showing page 5 out of 9 pages of 129 main-word entries or main-word-entry groups.